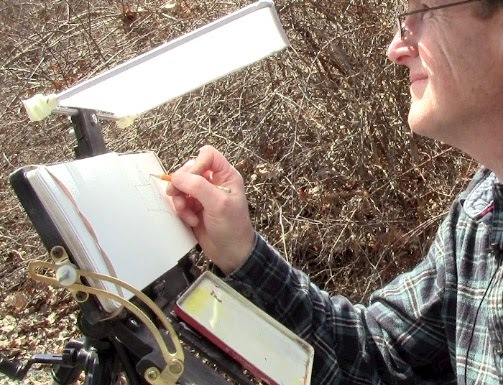 Getting the best light on your artwork while sketching outdoors makes a huge difference for seeing color. Ideally you want soft, diffused white sunlight at a level close to the brightness of the scene itself. The worst thing is cast shadows or dappled light across the painting. Controlling the light on your work can be difficult on a bright sunny day, which is why I came up with this easel-mounted diffuser. Unlike a white umbrella, this setup won't blow over in heavy wind. The diffuser affects the light only where you need it. The white diffusing panel is made using a recycled Pendaflex frame. These rectangular aluminum supports were used for hanging file folders. Over the frame I stretched white rip-stop nylon and sewed a seam around the edge. The angle of the diffuser is completely adjustable and the whole thing is removable, held in by a wood bracket at the top of the easel. Here's what it looks like on the side away from me. That bracket is a piece of plywood which is split so that it tightens against the aluminum bar. The wood bracket is held on with a Southco adjustable hinge , so that the whole bracket can fold down out of the way. My homemade easel system can work for either sitting or standing height, because it mounts on a camera tripod. 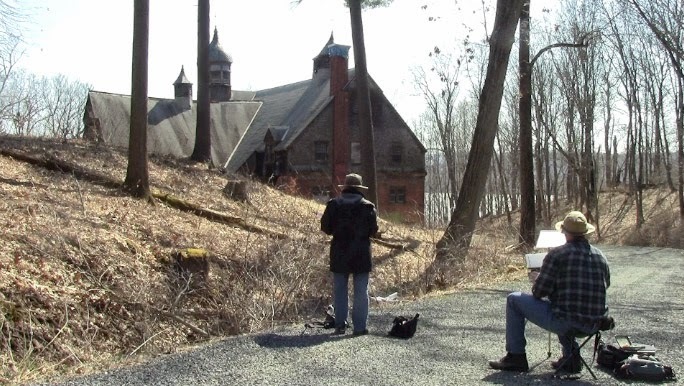 Here we were last week painting the old carriage house at the Wilderstein mansion here in the Hudson Valley. I'm painting contre-jour (facing the light), so the diffuser brings nice white light to my work surface. And here's the painting I did. I was conscious of lightening and cooling the top edge of the building silhouette to make the sky feel bright and blue without actually painting the sky blue. It's an effect I've noticed from photography and I wanted to try it out on an observational painting. 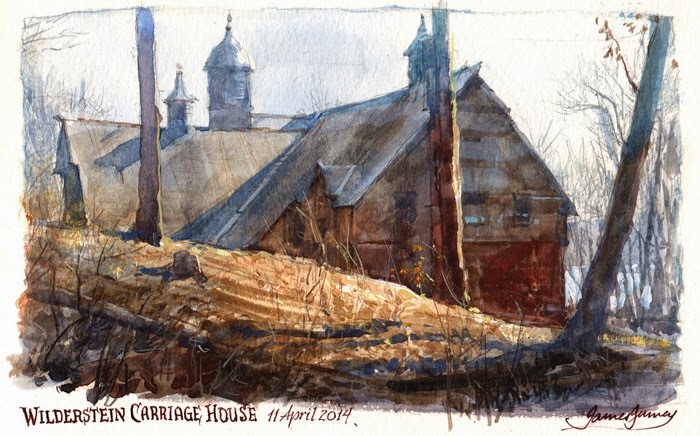 I documented the whole thing on video, and I'll be releasing that segment as part of an upcoming DVD/download on plein-air watercolor. If you make one of these diffusers, please send me photos of how you adapted the idea. Clever rig! I love that it affects the "light only where you need it." Like so many others (see Gurney Journey: Plein Air Painting Disasters) I've had an umbrella inadvertently become a sail providing lift for an air-borne tripod and wet painting. The landings have never been smooth. Your system has the economy of scale and simplicity of design that mark the best ideas. Fantastic! You mentioned once a diffuser for the figure in the outdoors. Is it similar, but much larger? The one thing I can't figure out is an easy way to anchor it, wind turns those kind of things into kites! Excellent Idea... I could never get the umbrella to work for me! I may even adapt this idea for my studio! Great idea! I usually use a white umbrella which creates a wonderful light on a sunny day, but as you said, a little wind and problems arise. I'll have to give this a try. But even more interesting to me is your observation about the bluieng of the top part of the building. Brilliant. Great idea James and yes on the bluing observation. 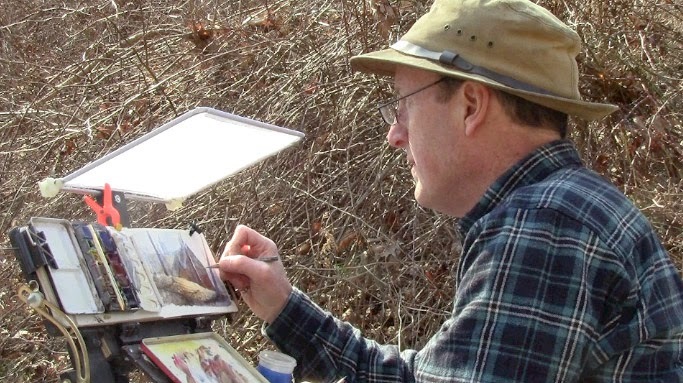 I like the notion that all does not have to be the 'Purist Plein-Air' point of view, that we can borrow from other mediums, even photography if done right. The painting looks like a watercolor, is it? One of your best for sure (I know, I always say that). ...oh, since Jenette does not have a blog maybe we could get a peak at hers? Yes, I have been quite in need of this solution< although my own kit is lite on its feet, so the next step is anchorage. The sun can be such a deterrent for me, so once again this is terrific and a MUST! 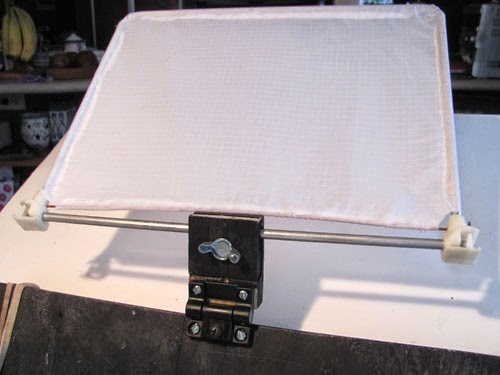 I've built an 'awning' style rig, and used a piece of Sunbrella fabric, on my easel, but that fabric blocked too much light, and you can't adjust the angle. Yours sounds neat- am going to try it.